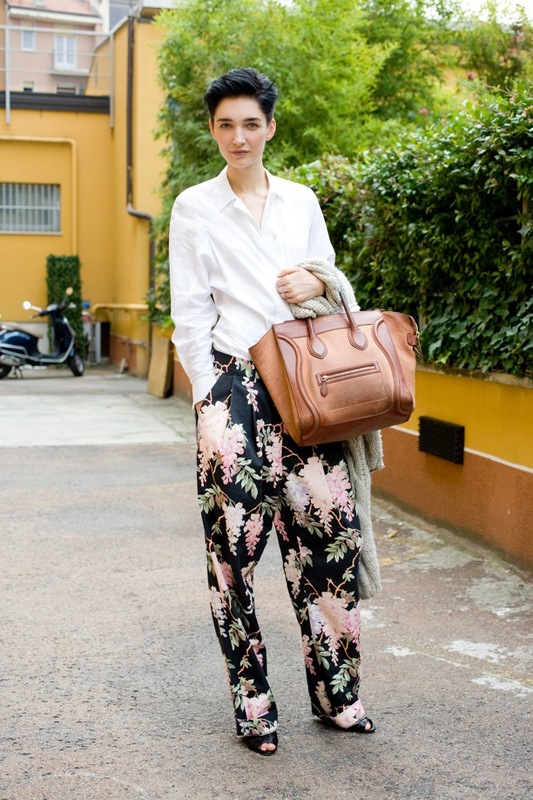 Street Style is nice on the eye…. Everyone knows I’m a sucker for street style and this upcoming Paris Fashion Week is no exception. Imagine walking the streets to be greeted by an array of visual creativity. A style treat before your very eyes. As you may have guessed, quirky style is my personal preference and its on the runways outdoors where this is best captured. Imagine this: Saint Laurent teamed with Celine and accessorised with a cool mix of haute and sport; the perfect style cocktail mixed effortlessly. What better backdrop to your walking masterpiece than the Carrousel du Louvre and other historical landmarks? Semi annually, the French put on a show stopper with some of the most chic street style wherever you look. In comparison with other Fashion Weeks such as New York and London, who champion a more edgy and experimental street style, Paris shows the world how to epitomise the ‘chic-ness‘ of Chanel. With Chanel today and Maison Martin Margiela tomorrow should come a flock of muted tones and elegant shapes, one thing always guaranteed at a Margiela show are a killer collection of accessories, so search the crowd for the latest shoes and bags finished off with a must-have pair of next season’s shades. Take note from the off duty model, who oozes casual chic and what better way to gain access to whats going on backstage than taking note off what the model wears off the runway? For the fashion forward, take style notes from the FROW fashionista. She knows what you’ll be wearing next season before it’s even sent down the runway. To find her simply walk the streets of Fashion Week! When it comes to style, interpretations differ from fashionista to fashionista. Whether you champion your look on your ability to piece together the best handpicked items from next season or you love to trawl through vintage fairs to find a hidden treasure, your look is a perfect presentation of you and should not warrant a price budget. So with that said, your own individual look shouldn’t depend on how much you spend. eBay is awash with trinkets and treasures for the quirky girl and with January meaning purse strings have to tighten, budgets for accessories have to be limited. It’s for this reason that my love for products ‘made in China’ is heightened. This week I’ve managed to snap these little beauties up at a fraction of the price that I’d find them on the UK high street. 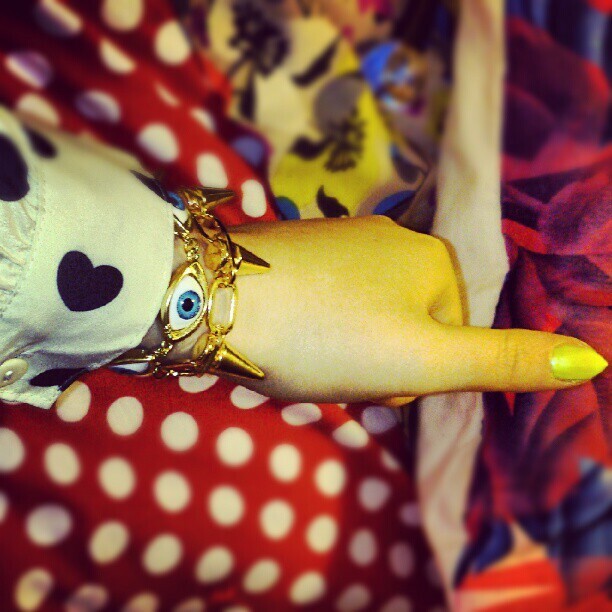 First was this lovely eye decal design bracelet that made my bank balance rejoice as it cost a mere £1 with free postage and packaging; now that’s what I call being a savvy fashionista! Next was the spike detail bracelet which was the same price. Seem too good to be true? Well it really isn’t! The badass look was prevalent for Fashion Week SS13 with spikes and studs being sent down the runways of Tahir Sultan in London. For this reason, you can be sure that the edgy trend that has seen us through AW12 has been granted somewhat of a prolonged shelf life. As you may have guessed if you follow plainQUIRKY on Instagram, nail art has been something that has had my creative side in a spin. Normally, I’d be splashing out on the latest Chanel, Essie and OPI offerings, however I’ve decided to have a look to see what nail polishes with all altogether cheaper price tag have to offer. With neon set to be a huge trend this coming SS13 after being seen at shows such as Topshop Unique, I purchased a neon yellow polish from China with a £1 price tag. Apart from the strong polish scent, it wears just as well as the other brands! Teamed with the next big nail trend, the claw, my nails were winners all round! I have a new obsession. 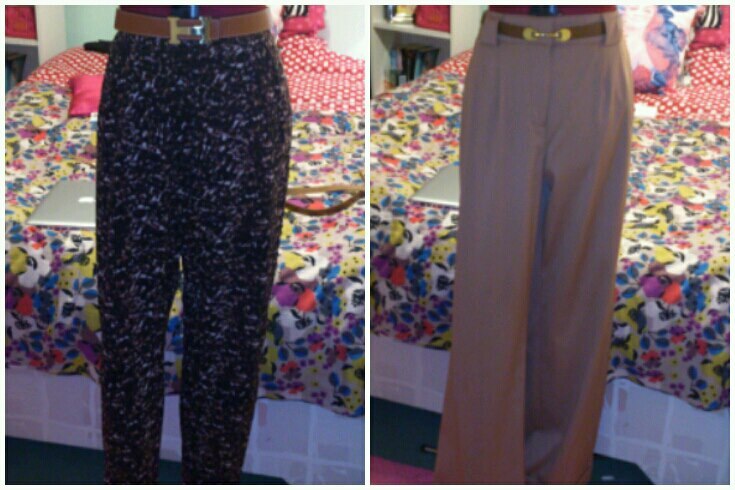 Yes, this month my wardrobe is all about statement pants. Every season, designers tend to give a subtle nod to this trend, with AW12 having a glimpse of what is to come but SS13 is afloat with designers bringing you their most cutting edge creations yet. Even Kate Moss has been spotted sporting a pair and you will be scouring the High Street to find the most eye-catching pair before the year is through, trust me! The Street Style of SS13 Fashion Weeks saw Fashionistas from all over the globe broadcasting their most flamboyant prints, especially at Milan, where the Fashion Pack were hell-bent on making a statement with their lower half. Although it’s too early for me to be over bold, SS13 Fashion Week promised sepia tones to be a huge hit, especially with MAC sending drones of models down the catwalks with their faces a reflection of one of the season’s hottest hues. So with that said, I want to bring a little bit of SS13 to the dreariness of Winter by subtly adding this colour palette to the statement trousers I choose. For me, that’s a winning combination and totally on the money. I’ve had these two pairs from Topshop for a few years now but I really think they sit so well with the trend that I’ve resurrected them from the bottom of my wardrobe. With the Hermes belt to accessorize, winter blues are a thing of the past! 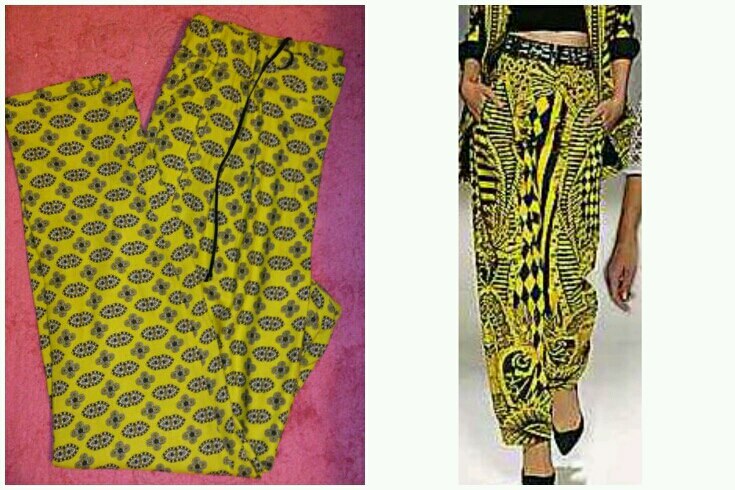 One of my favourite pieces to compliment this trend has to be the Balmain SS13 statement trouser, with eye-catching yellows contrasted with bold blacks. This look isn’t easy to carry off in the Winter, however, I found a toned down interpretation of these in the Warehouse sale and a fraction of the price, easily curing me of any January blues! Talking of sales, I found these in the ASOS sale and fell in love. 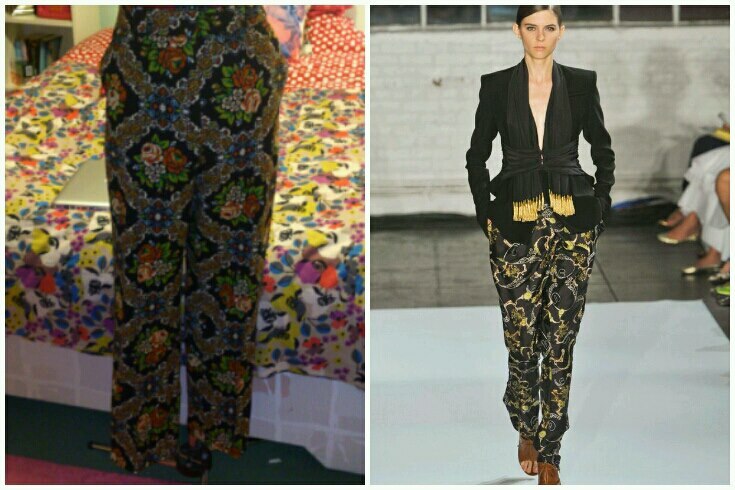 They immediately reminded me of the 3.1 Philip Lim statement trousers and I just had to give them a loving home in my wardrobe! They balance bold and subtle in the perfect paradox by being eye-catching but not too overbearing and are perfect teamed with an oversized ‘boyfriend’ shape coat and your favourite winter boots. So for me, I can’t get enough of these and it makes my insides cartwheel to know that they will easily make the transition in to SS13. Being a savvy fashionista has always been in. It’s been a long week and it’s only Tuesday, so when I arrived home to the sight of a delivery with my name written all over it; all work related stresses quickly evaporated. I think retail therapy should be a recognised treatment for the weak and stylish and I’ll happily admit that it works for me every time! This season I have neglected the shoe department of my wardrobe. This soon had to be remedied by the quick sale of a pair of fabulous backless heels. I’m a sucker for rose gold and it was my accessory hue of last Winter. I’ve decided to drag it into this year by purchasing these little beauties with a thin rose gold heel: Instant glamour! I hope I exaggerated enough how much I’d neglected this area of my wardrobe as I kind of bought the same pair in lime green with the same rose gold heel but this is totally justified by the fact that these are for Summer and I’m forward planning! Oh well, a girl can never have too many shoes! Oh and necklaces and maybe a dress and peplum top too….Ooops! ASOS has to be one of my favourite High Street retailers as it houses not only some of the most cutting edge designs fashioned by some of the coolest fashionistas, it’s diversity allows it to branch away from the High Street and offer vintage treasures from their Marketplace addition. It’s a one stop shop for the girl (and boy!) who knows that street style is the best style. I’m still waiting for my delivery from an order from their Marketplace…….like I said: It’s been a long week! Look Hot In The Cold…..
For me, my winter wardrobe is like a dressing up box. You can layer almost anything and still create something that screams cool, even if it does teeter a little on the bulky side! England is cold, after all! Winter seasons tend to see designers losing some of their creative flair as bland colours are often favoured over the more vibrant hues of Summer. This shouldn’t be the case. I’m a little tired of wearing muted tones so here’s a pick of some of this seasons colourful pieces I’ll be taking inspiration from. Charlotte Olympia always delivers in the quirky stakes, from her Russian doll inspired stiletto’s of the Summer or her jingle bell beauties that are certain to have people talking this Party Season. Her Christmas pudding flats may not be to everybody’s taste but I’m riding that bandwagon because I shamelessly love everything Charlotte Olympia & Christmas! The Olsen Twins for me epitomise modern-day grunge and it’s a trend I’ve dug my claws into for the past couple of seasons. Its edgy and open to personal interpretation and what I love about The Row is that it mixes grunge with elegance with perfect antithesis. You’re less likely to look like Kurt Cobain but more like one of the Olsen’s themselves. Layer this little Acne beauty of The Row’s Bani dress & you’ll be bringing the colour blocking trend all the way to Winter. Winter is all about the accessory. Whether it be in the shape of a scarf or a fierce pair of boots you can be as create as your heart contents. For me, it’s all about the hats. I don’t have the head for hats but that doesn’t phase me! I’m loving Lanvin’s Pom Pom beanies and make the grunge trend teeter on the cute. Two words I’d never put together but make a perfect partnership; don’t you agree? Knitwear is a Winter time staple, be it your favourite Christmas jumper (c’mon, we all have one!) or your trusty Aran jumper. I’m going for bold this year and I’ve fallen head over heels for Meadham Kirchhoff’s Maria bauble sweater! It’s the perfect Christmas Day treat and will certainly have you filled with festive joy! I love this almost as much as the Hibiscus Monster coats seen earlier this year. Quirky on a whole other level. If the whole ‘Christmas Jumper Club’ isn’t one you want to be a member of, Marc Jacobs has a collection enough to give a subtle but cooler nod to the trend. Whatever your choices this season, make sure to make them bold, you’ll sure to be noticed! I’ve had such a lovely little weekend. Christmas has to be my favourite times of year (apart from Fashion Weeks, of course!) and what better way to get into the christmas swing of things than to visit a Christmas Market, in Cologne no less. I had the usual dilemma of what to pack, I had enough to clothe a small town but you can never have enough outfit choices! For me it was all about the fur. You can’t go to Germany without channeling your inner Hollywood icon and you certainly can’t forget your best red lipstick! I’ve always wanted to go to a German Christmas market, to sample the mulled wine, spy the little Hansel & Gretel gingerbread houses and get truly swept away with the Christmas spirit that is ever-present at this time of year. Plus if you follow plainquirky on Instagram, you’ll know of my love for russian dolls, so when I found a stall with the best collection ever, I felt like a child let loose in Willy Wonka’s factory! I made my journey via Munich airport, which was a holiday in itself. Step off the plane into the loving bosom of Hermes, Salvatore Ferragamo and Burberry to name but a few. Seriously, if I wasn’t so set on eating German sausage in Cologne I’d have spent the duration of my weekend here! Cologne fashion doesn’t really do it for me though to be honest. I was more impressed with how the men dressed. Sharp and well-groomed, they outshone the women in the fashion stakes. It seemed such a shame to grace them with such names as Hermes and Louis Vuitton when they didn’t appear to be making best use of them, I should really put my claws away! Although I loved how unfazed people were by men walking through shops with French bulldogs on leads – how very glamourous!? The Cathedral of Cologne is really a credit to the City. If you’re a fan of fine architecture I’d really recommend a trip to see it. It reminds me somewhat of Notre Dame in Paris and I think it’s because there is something very gothic about it and very inspiring. My photos don’t do it half as much justice! All in all Cologne has the ingredients to provide a truly magical Christmas. With its stalls of traditional German foods or quirky decorations for your home, it gives you that warm Disney type feeling. I’m getting all cheesy here and I’ll stop before I cringe myself out but I really can’t praise it enough for getting me out of my Scrooge frame of mind and filling me full of cheer. Plus it gave me an excuse to bring out my Winter coat that’s been dying to make an appearance – winner! Oh, & thank God for my Bobbi Brown extra balm rinse, my skin felt the cold but Cologne was defiantly worth a bout of dry skin!